Note: This article was first published by The Daily Beast. The Taliban, which refers to itself as the Islamic Emirate of Afghanistan, quickly praised the “Moscow tripartite” in a statement posted online on Dec. 29. Of course, the Taliban isn’t interested in “peace and security.” The jihadist group wants to win the Afghan war and it is using negotiations with regional and international powers to improve its standing. The Taliban has long manipulated “peace” negotiations with the U.S. and Western powers as a pretext for undoing international sanctions that limit the ability of its senior figures to travel abroad for lucrative fundraising and other purposes, even while offering no serious gestures toward peace. The Obama administration has repeatedly tried, and failed, to open the door to peace. In May 2014, the U.S. transferred five senior Taliban figures from Guantanamo to Qatar. Ostensibly, the “Taliban Five” were traded for Sgt. Bowe Bergdahl, an American who reportedly deserted his fellow soldiers and was then held by the Taliban and its jihadist allies. But the Obama administration also hoped that the exchange would be a so-called confidence-building measure and lead to more substantive negotiations. The Taliban’s leaders never agreed to any such discussions. They simply wanted their comrades, at least two of whom are suspected of committing war crimes, freed from Guantanamo. Regardless, Russia is now enabling the Taliban’s disingenuous diplomacy by pretending that ISIS is the more worrisome threat. It’s a game the Russians have been playing for more than a year. In December 2015, Zamir Kabulov, who serves as Vladimir Putin’s special representative for Afghanistan, went so far as to claim that “the Taliban interest objectively coincides with ours” when it comes to fighting ISIS head Abu Bakr al Baghdadi’s loyalists. Kabulov even conceded that Russia and the Taliban have “channels for exchanging information,” according to The Washington Post. The American commanders leading the fight in Afghanistan don’t buy Russia’s argument—at all. According to Nicholson, the Russian “narrative” is “that the Taliban are the ones fighting the Islamic State, not the Afghan government.” While the Taliban does fight its jihadist rivals in the Islamic State, this is plainly false. The “Afghan government and the U.S. counterterrorism effort are the ones achieving the greatest effect against Islamic State,” Nicholson said. He went on to list the U.S.-led coalition’s accomplishments over the past year: 500 ISIS fighters (comprising an estimated 25 to 30 percent of the group’s overall force structure) were killed or wounded, the organization’s “top 12 leaders” (including its emir, Hafiz Saeed Khan) were killed, and the group’s “sanctuary” has been reduced from nine Afghan districts to just three. There’s no doubt that ISIS’s operations in Afghanistan grew significantly in the wake of Baghdadi’s caliphate declaration in 2014. However, as Nicholson correctly pointed out, Baghdadi’s men are not adding to the territory they control at the moment. Their turf is shrinking. The same cannot be said for the Taliban, which remains the most significant threat to Afghanistan’s future. At any given time, the Taliban threatens several provincial capitals. The Taliban also controls dozens of Afghan districts and contests many more. Simply put, the Taliban is a far greater menace inside Afghanistan than Baghdadi’s men. Regardless, the Russians continue to press their case. Their argument hinges on the idea that ISIS is a “global” force to be reckoned with, while the Taliban is just a “local” nuisance. Someone should tell the Taliban’s media department this. 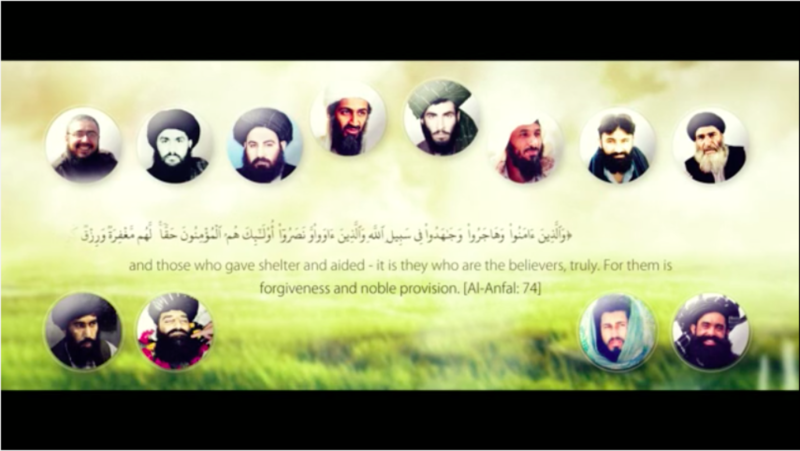 In early December, the Taliban released a major documentary video, “Bond of Nation with the Mujahideen.” The video included clips of the Taliban’s most senior leaders rejecting peace talks and vowing to wage jihad until the end. It also openly advertised the Taliban’s undying alliance with al Qaeda. At one point, an image of Osama bin Laden next to Taliban founder Mullah Omar is displayed on screen. (A screen shot of this clip can be seen above.) Photos of other al Qaeda and Taliban figures are mixed together in the same shot. An audio message from Sheikh Khalid Batarfi, an al Qaeda veteran stationed in Yemen, is also played during the video. Batarfi praised the Taliban for protecting bin Laden even after the Sept. 11, 2001 hijackings. “Groups of Afghan Mujahideen have emerged from the land of Afghans that will destroy the biggest idol and head of kufr of our time, America,” Batarfi threatened. The Taliban’s message is, therefore, unmistakable: The war in Afghanistan is part of the global jihadist conflict. All of this, and more, is in one of the Taliban’s most important media productions of 2016. There is no hint that the Taliban “regrets” allying with al Qaeda, or has given “up the global jihadism idea,” as Kabulov claims. The exact opposite is true. There is much more to the Taliban-al Qaeda nexus. In August 2015, al Qaeda honcho Ayman al Zawahiri swore allegiance to Mullah Mansour, who was named as Mullah Omar’s successor as the Taliban’s emir. Mansour publicly accepted Zawahiri’s fealty and Zawahiri’s oath was prominently featured on the Taliban’s website. After Mansour was killed earlier this year, Zawahiri pledged his allegiance to Mansour’s replacement, Mullah Haibatullah Akhundzada. Zawahiri and other al Qaeda leaders regularly call upon Muslims to support the Taliban and reject the Islamic State’s Afghan branch. Kabulov is right that the Haqqanis are committed jihadi ideologues, but he misses the obvious contradiction in his arguments. Siraj Haqqani, who leads the Haqqani network, is also one of the Taliban’s top two deputy leaders. He is the Taliban’s military warlord. Not only is Siraj Haqqani a “radical” ideologue, as Kabulov mentions in passing, he is also one of al Qaeda’s most committed allies. Documents recovered in Osama bin Laden’s compound show that al Qaeda’s men closely cooperate with Siraj Haqqani on the Afghan battlefields. Kabulov claims that the Islamic State “operates much more smartly” than al Qaeda and has “learned from all the mistakes of al Qaeda.” He says Baghdadi’s enterprise has “brought more advanced and sophisticated people to design, plan, and [execute] policy.” Once again, the exact opposite is true. Al Qaeda has long known the pitfalls of the Islamic State’s in-your-face strategy, and has smartly decided to hide the extent of its influence and operations. Zawahiri and his lieutenants have also used the Islamic State’s over-the-top brutality to market themselves as a more reasonable jihadi alternative. And both the Taliban and al Qaeda are attempting to build more popular support for their cause as much of the world remains focused on the so-called caliphate’s horror show. Al Qaeda’s plan has worked so well that the Russians would have us believe that the Taliban, al Qaeda’s longtime ally, should be viewed as a prospective partner. Kabulov says that Russia is waiting to see how the “new president, [Donald] Trump, describe[s] his Afghan policy” before determining what course should be pursued next. Here’s one thing the Trump administration should do right away: Make it clear that the Taliban and al Qaeda remain our enemies in Afghanistan. So the US, fostering and promoting “moderate” fundamentalistic fighters in Syria (and many other places) that closely and openly cooperate with al Nusrah in an attempt to overthrow a secular western-orientated government and go back to the good old times of sharia and killing minorities, is now enraged about russian diplomacy promoting fundamentalistic fighters in Afghanistan that closely cooperate with AQ in an attempt to overthrow a non-functioning bizzare western-antiwestern government and go back to the good old times of sharia and killing minorities. The Taliban also receive support from Iran. This is the same line Obama tried to promote in 2009. It also has the ‘advamtage’ of being another failure of NATO. 70% Pakistan 20% Gulf Arabs 10% Russian and Iranian support, if that. And never forget the opium. Problem includes that other area of failure. America needs to drive a wedge between Pakistan and Russia. That’s the unholy alliance right there. Kerry is nowhere to be seen, away drowning his failures in vintage Bordeaux. Putin will ditch Pakistan and their Frankensteins (TB) if Rex rubs Russia right. He (RT) will, I think. Putin is just positioning. He knows how Pakistani and evil the Taliban are. As I have been saying for ten years, a global alliance between Russia and America to vanquish global jihad is the only possible path to radical Islam’s elimination. Start now. Rob, odd comment. Denial of what, pray tell? If the US wants peace in Afghanistan then it must go after all terror groups in Afghanistan and not just the Afghan Taliban because there are many other culprits – enemies of humanity in Afghanistan like TTP , LEI , LEJ , Al-Qaeda and JUA. More importantly the Northern Alliance must be eliminated ! I’ve the strangest feeling that we are about to feel the knife slide between our back ribs. I suspect the Russian pilot and Pakistani passengers real destination was Kunduz province to undermine Coalition efforts to stabilize northern Afghanistan. Let me update you a little…There are many terror groups in Afghanistan but world just believes that Afghan Taliban are the worst which is not correct. That helicopter was going for an over hauling to Uzbekistan and the Russian was a navigator. The helicopter was crashed and the crew was taken into custody by IS – TTP…..and after some time those Afghan Talib’s freed those hostages from terrorists…later on it was discovered that the kidnapping was done on the order of Afghan Government. NOW THE NEW POLICY IS POSTED TERRORIST GROUPS SIMILAR TO THE CHARTS OF POP MUSIC. Pakistan has no interest in Taliban per se. It wants a negotiated settlement of Afghan situation for its durability. Taliban are mostly Pushtun who are over 40 % of the population but are grossly neglected . But without their participation, no government will survive in Kabul. Pakistan wants stability and development in Afghanistan and has no other interest there. Nice words. Ask the ISI for the facts on the ground, which are different than what you infer. Pakistan wants a weak and unstable Afghanistan in case it needs the ground as a rear area in a war with India and has to occupy it quickly. TB become pre-positioned assets, at minimum, friendly government at best. If the US can support Syrian rebels who undermine the Syrian Government and Syrian Forces then why cant Russia support Afghan Taliban in its fight against IS in Afghanistan ? If the US can support Kurdish militants who undermine the Turkish Government and Forces then why cant Russia support Afghan Taliban against the IS in Afghanistan ? Putin did the USA a favor by posing with China and Pakistan as a Taliban support nexus. Trump can only process that in one way that produces a win for ‘Murica. Better yet, the ‘Kabulov’ message is so full of bull, it makes the counter-argument that Russia-China-Pakistan are getting into bed with the Taliban to sell weapons, protect investments and make a circus in the UNSC to obstruct NATO and erode continued support for civilized government in Afghanistan, however kleptocratic it has been. Trump gets to blast the unholy alliance as good enough reason to drop US assistance to Pakistan, since they would prefer to sell out to the Dark Side’s masters. Leveraging Pakistan to force cooperation on a range of issues central to breaking Taliban safehavens and income streams, that’s pretty much the Year 1 agenda for Trump and Co. If you grasp that, you can see how bad a move it was for the Pakis, for Sharif to send his people to Moscow. Good points. My view is that the best way to squeeze PK is to present a united China-Russia-USA front against them. India remains neutral. Trump will see the utility of a practical partnership against the Pakistanis and should be amenable to working with China and Russia to counter Global Jihad stemming from Saudi Arabia and Pakistan. Agree amongst the Big Three to never give or sell Pakistan another bb gun. See how long they can obtain spare parts for what they have. Make denuclearization the criterion for lifting the arms embargo. The Taliban have always threatened to be non interventionist islamists if left alone. Perhaps the Russians are taking that threat seriously. Despite the obvious problems with Jihadis that Russian has in its own backyard, they are making these steps obviously in their own perceived self interest. Russia is in a position like the Byzantines. Powerful but precariously so. Russia has a demographic (decline of ethnic russians and expansion of non ethnic muslim) crisis that is exploding and will continue to do so. In the event of any real conflict, Russia cannot defend itself from multiple directions being basically a steppe nation. They have been invaded by surprise three times in 200 years. defeat was possible each time. Everything Russia does should be kept in context of the ongoing demographic crisis, it’s indefensible borders and its ongoing problems with jihadists and the fact that has been invaded three times in 200 years by nations that 20 years prior to the invasion looked incapable of doing so. If Russia starts to pay Afghanistan’s bills again then for god’s sake let them. Slam shut the cash drawer on the way out the door and let’s bail out of that money pit. Come home and be done with it. The US is still supporting terrorist pkk/ypg/pyd against turkeys Euphrats shield. Supporting terrorism brought and will bring terrorism to the US. One man’s freedom fighter is another man’s terrorist. So why shouldnt Russia do that for their own interests?! Boom! Boom! They went straight for the NDS. Want to bet the ISI chose this target and helped build the VBIED? Arms embargo Pakistan, President Trump. They are nothing but trouble. Ok, so they targeted a “meeting on peace”. ISI doesn’t want peace, so they blew it up. This isn’t rocketry. ISI kills peace in AFG, hiding behind the burqas of the TB.